The Italian brand Gucci presents three new collections of watches, bearing the symbol of elegance and quality. 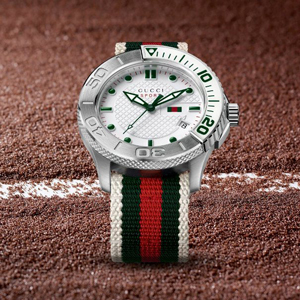 Gucci Timepieces shows a sporty with the classic colors of the brand and style match-up, ideal for summer. On the other hand, we see a more sophisticated, inspired by the iconic symbol of the G’s interlaced, combining fashion with Swiss precision. An elegant addition to any summer look, this accessory will maintain its fresh appeal even after the warm weather fades. Finally, the Bamboo line, classic and elegant at once, in stores since last April, a timeless piece that becomes a must.